With a foreword by bestselling author Randy Alcorn, Reclaiming Heaven's Covenant teaches you to connect with God and others in a way that will affect your marriage, how you raise your children, your job, finances and more. 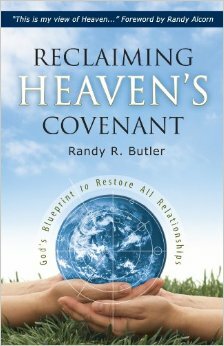 It's a book on developing healthy, long-lasting, loving, interpersonal relationships that connects heaven with earth just short of death. The bridge between the two is a covenant renewal model that if properly applied can positively impact all areas of your personal life. Butler gives us the model that in use, will sharply curtail divorce as we know it. And, it even works within politics! - Randy Alcorn Author of Heaven and If God is Good. In an age when our worldly culture is distancing itself from interpersonal relationships and is trending instead toward electronic relationships, Butler shares this model that connects us all together in a better technology; one that is out of this world!